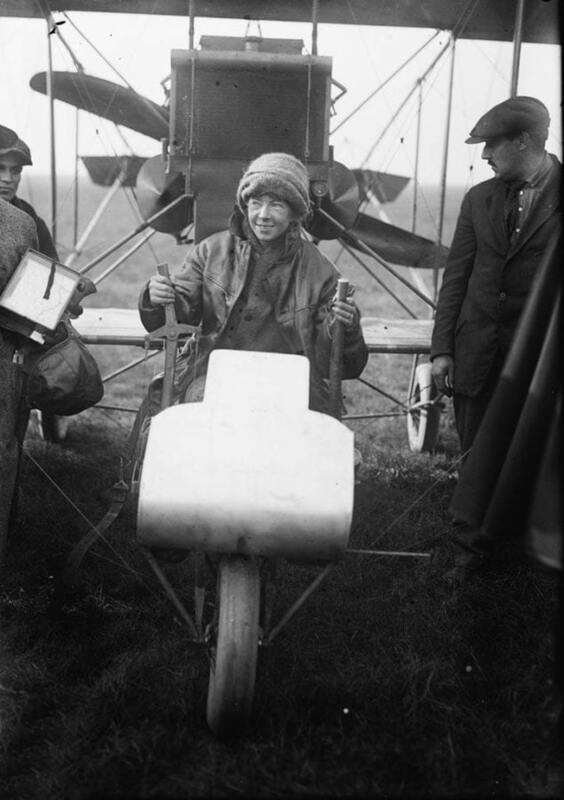 When Ruth Law Oliver embarked on a campaign to allow women to fly military aircraft in 1917, she could not have known that it would take another 25 years and the advent of another world war for women to realize her ambition. The first female pilot to fly and fight wouldn’t come along for another 78 years. But when she did, Lt. Col. Martha McSally wore an Air Force flight suit. Oliver was born in Massachusetts in 1887. She got her pilot’s license in 1912, flying an airplane she bought from Orville Wright. Oliver made her name in aviation as a stunt pilot and record-breaker, the first woman to loop the loop and to make a night flight. In November 1916, she broke the existing cross-country speed/distance record of 452 miles (set by Victor Carlstrom) with a nonstop 590-mile flight from Chicago to New York state. Oliver flew on to New York City the next day, running out of fuel over Manhattan. She made a dead-stick landing on Governors Island, where she was met by Army Capt. Henry “Hap” Arnold, who reportedly changed the spark plugs on her Curtiss Pusher. The future commanding general of the U.S. Army Air Forces may have inspired the young aviatrix; her effort to get women into the cockpits of military aircraft followed five months later, after America entered World War I. Since its earliest days, nurses have served alongside and in the American military. The profession was the first in which women were formally recognized by the armed forces. That recognition was partially extended by Congress in 1901 with the establishment of the Army Nurse Corps. Despite the nomenclature, Army Nurse Corps personnel were not considered part of the Army, though in 1920 they did receive officer-equivalent ranks and wore Army rank insignia on their uniforms. America’s entry into World War I drove the rank and uniform adoption. Some 20,000 female registered nurses were recruited for Army and Navy duty in 58 military hospitals. More than 5,400 received training in the Army’s newly established School of Nursing, including those who helped staff 47 ambulance companies operating on the Western Front. Their work in forward-deployed Army field hospitals was a precursor to the nursing women would undertake as flight nurses in World War II. The Nurse Corps shrank dramatically during the interwar period. Fewer than 1,000 nurses were available by the time of the attack on Pearl Harbor, but expansion was swift once America declared war. So was reorganization. A significant portion of those inducted became part of the Army Air Forces (AAF) Nurse Corps and a subset became flight nurses. Second Lt. Suella Bernard smiles and shakes hands with Lt. Foster, head nurse, while 2nd Lt. Mary Jane Brown of Columbus, Ohio, looks on. Brown brought poppies together with wounded from a beachhead in Normandy. 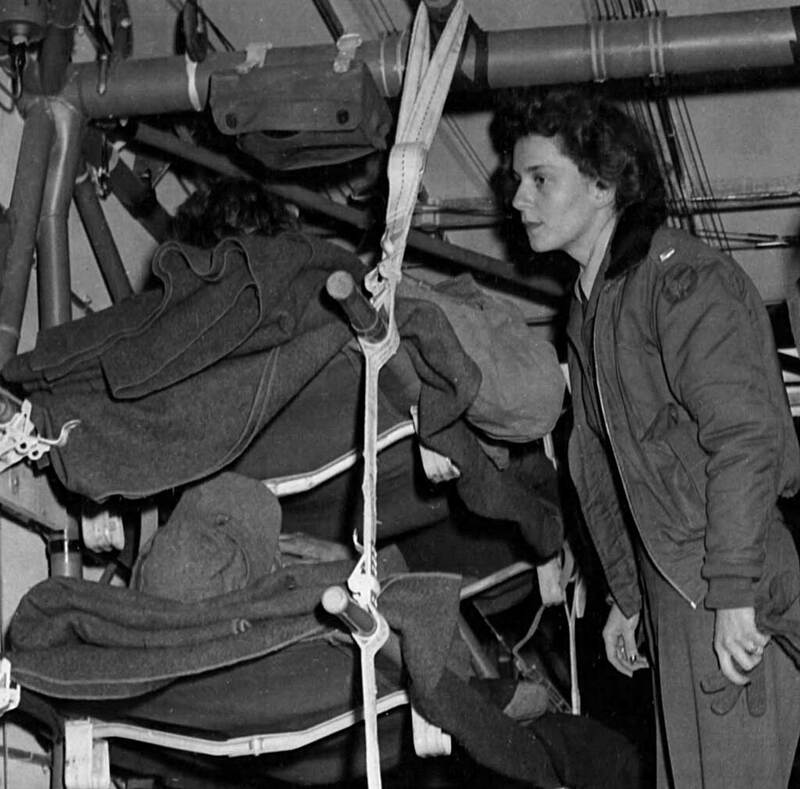 They were two of the nurses first to go on this Ninth Air Force evacuation mission and first to return with wounded to England. Flight nurses were integral to the newly formed concept of aeromedical evacuation. Advances in aircraft size, power, and reliability in the late 1930s meant they could be adapted as medical evacuation tools, saving significant time in getting serious casualties from the battlefront and saving lives as a result. Wounded patients traveling by air needed medical oversight, hence the creation of flight nurses. First Lt. Suella V. Bernard was one of the first two nurses to fly into Normandy after the D-Day invasion. In March 1945, she volunteered for a glider mission into combat, the only flight nurse known to have done so during the war. 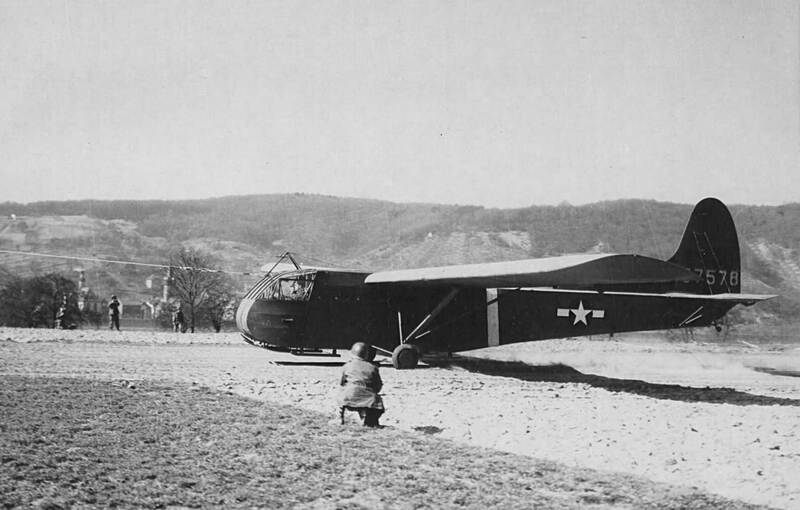 Two CG-4A gliders undertook the mission, landing in a clearing near the bridgehead at Remagen, Germany, to evacuate 25 severely injured American and German casualties. The first class of AAF flight nurses graduated from Bowman Field, Kentucky, in February 1943. In June of that year, the Army formally established the Army Air Forces School of Air Evacuation there to offer specialized training for its flight nurses. Bernard tends to patients in one of the two CG-4A gliders before the C-47s arrived. But with casualties beckoning from the invasion of North Africa in November 1942, a cadre of women who had yet to finish their training were called up and sent to the theater on Christmas Day. They were volunteers – as were all flight nurses – who were also required to be single and generally between the ages of 20 and 30. They worked aboard C-46 and C-47 aircraft used for cargo/troop carrying (later C-54s) as well as aeromedical evacuation (AE). As a result, the airplanes carried no Red Cross, and, indistinguishable from their stablemates, were sometimes subject to enemy fire. First Lt. Mary Louise Hawkins was evacuating 24 patients from the fighting at Palau to Guadalcanal in September 1944 when the C-47 in which she was flying ran low on fuel. The pilot made a forced landing in a small clearing on Bellona Island. During the landing, a propeller tore through the fuselage and severed the trachea of one patient. Hawkins fashioned a suction tube from various items including the inflation tube from a “Mae West.” Using the improvised tube, she kept the man’s throat clear of blood until aid arrived 19 hours later. All of her patients survived. For her skill and courage, Hawkins received the Distinguished Flying Cross. So did 1st Lt. Aleda E. Lutz. Lutz flew 196 missions and evacuated more than 3,500 men during the war. In November 1944, during an evacuation flight to Italy from the front lines near Lyon, France, her airplane crashed with no survivors. Awarded the Air Medal with four Oak Leaf Clusters, she posthumously received the Distinguished Flying Cross. Hers was not the only sacrifice: 17 flight nurses lost their lives during the war. Approximately 500 Army Air Forces flight nurses served with 31 medical air evacuation transport squadrons during World War II. They evacuated 1,176,048 patients throughout the war, just 46 of whom died en route. The regard in which they were held led flight nurses to become popularly known as “Winged Angels.” Their legacy lives on in the Air Force today as female and male nurses serve in AE teams aboard C-17, C-130, and other aircraft in all theaters. Once the gliders were loaded, C-47 transports successfully snatched them from their landing site near enemy fire and towed them aloft to a military hospital in France. Bernard received the Air Medal for her action. Many more flight nurses attended patients on intercontinental evacuation flights from the European and Pacific theaters back to the United States. Such flights required vigilant care of seriously wounded patients over several days. By ship and ground transportation, the same trip back to the safety of America would have taken months. Among the many changes forged in World War II was the elevation of women to flying military aircraft. The idea of employing women to fly aircraft in noncombatant roles had been advanced during the 1930s, but it wouldn’t be realized until 1942. Female pilots never formally became part of the Army Air Forces, but they served it with distinction. 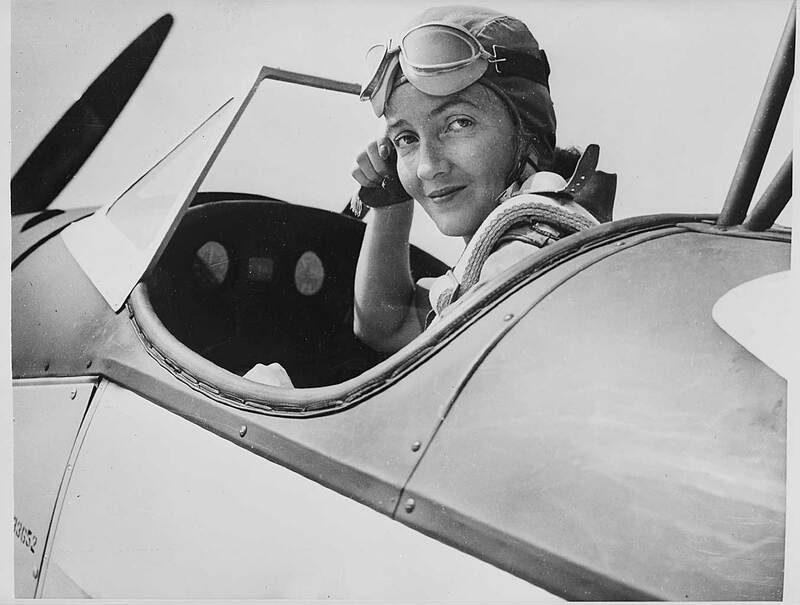 In the immediate aftermath of Pearl Harbor, renowned aviatrix and air racer Jacqueline Cochran sought to put female pilots in the cockpits of military airplanes flying within the United States. At the request of President Franklin D. Roosevelt, she prepared a report, “Organization of a Woman Pilots’ Division of the Air Corps Ferrying Command,” in July 1941. Utilizing women pilots for stateside ferrying, check flights, and other tasks would free male pilots for training, combat, and deployment. Her proposal met with skepticism and no action. Disappointed but armed with the knowledge that British women were already ferrying military aircraft from factories to operating bases in the U.K. for the British Air Transport Auxiliary (ATA), Cochran recruited a group of American civilian women pilots to serve in the ATA. She accompanied them to England, then returned to the United States to recruit a second group. As Cochran shepherded her flock abroad, Nancy Harkness Love, a noted aviation entrepreneur, test pilot, and air racer, advanced her own proposal for female ferry pilots. Leveraging her own connections and those of her husband (Robert Love, deputy chief of staff of the Ferrying Command), Love convinced Army Air Corps leadership that women ferry pilots could be valuable. Overlap between the two organizations was inevitable, and, logically, they were merged into a single organization – the Women Airforce Service Pilots, or WASP – on Aug. 5, 1943. 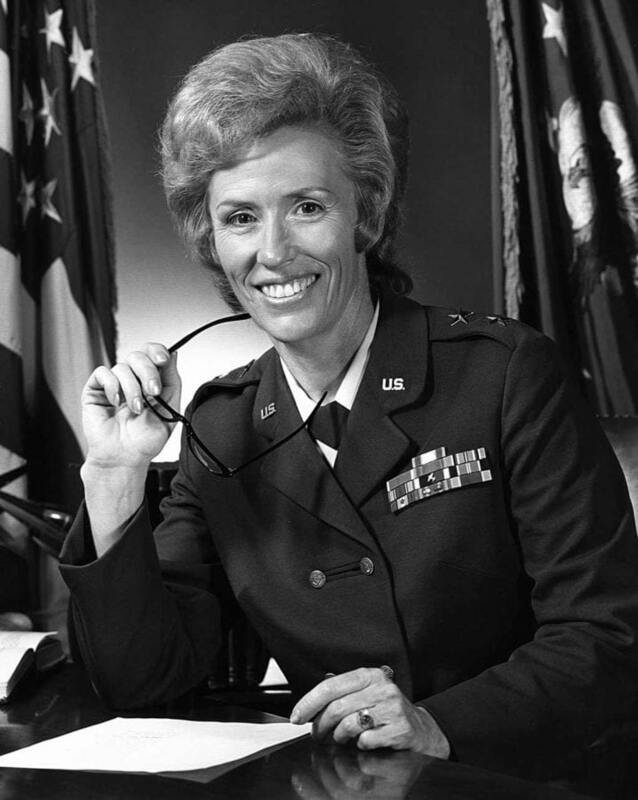 Cochran would serve as director of the WASP and its training division. Love would head its ferrying division. More than 25,000 women applied to join the WASP during its 16-month lifespan. Just 1,879 applicants were accepted, and of these, 1,074 completed thorough flight training at Avenger Field in Texas. Their washout rate bettered the average for male pilots. Love was appointed as executive of women pilots to the staff of the newly minted Air Transport Command (ATC) in early 1942. Within months, she recruited 29 experienced female pilots to join the newly created Women’s Auxiliary Ferrying Squadron (WAFS). Love became their commander. In September 1942, the WAFS began flying from New Castle Army Air Field, Wilmington, Delaware, under the aegis of the 2nd Ferrying Group. Strict qualifications for joining meant that only 40 women wore the WAFS uniform – which they had to pay for. Meanwhile, Cochran had learned of the formation of the WAFS while in England. Upon returning, she convinced Gen. Arnold that the WAFS wouldn’t be able to supply the number of women pilots needed for domestic ferrying operations. Cochran and Love were both racers and it is not difficult to imagine an unspoken competition between the two women to lead America’s first female ferry pilots. Arnold and Cochran agreed that enlisting female pilots in the Women’s Army Corps (WAC) was too cumbersome to proceed quickly. Instead, Cochran established the Women’s Flying Training Detachment (WFTD) at Howard Hughes Airport in Houston, Texas, Nov. 16, 1942. The 25 women who made up the initial class were required to have 200 hours flying time and a commercial license. Like the WAFS, WFTD pilots ferried aircraft to operating bases. But they also instructed male pilot cadets, delivered planes for repair, performed subsequent check flights, slow-timed new engines, flew searchlight tracking missions, and towed targets for anti-aircraft gunnery practice. By the time the WASPs were disbanded, nearly 6,000 women had been trained as Link Trainer operators and were teaching male pilots how to read instruments. Approximately 40 percent of the air traffic controllers serving the AAF and Navy were women. NASA’s forerunner – the National Advisory Committee for Aeronautics (NACA) – hired women to work as scientists, engineers, and analysts, reviewing data from wind tunnels on airplane prototypes that the AAF would place into service. 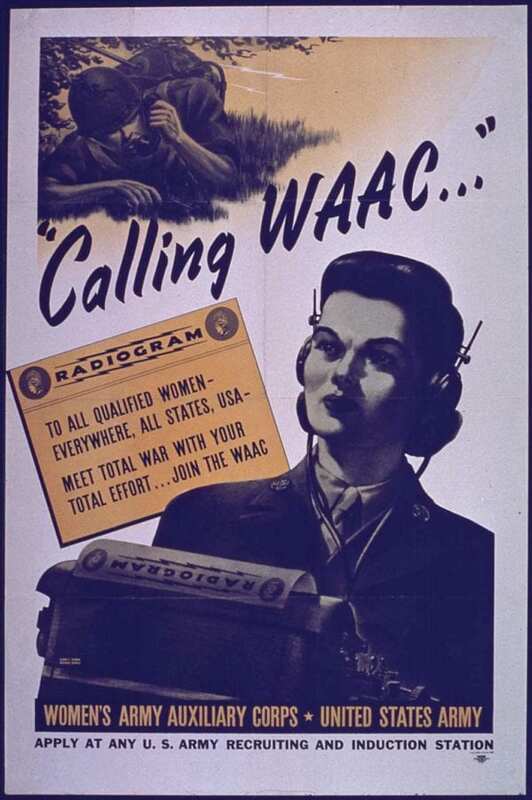 While Cochran pressed for full militarization of the WASP, she continued to advocate that it be separate from the WAC. Part of her reasoning was that some of the most experienced WASPs were mothers of young children. WAC recruits had to be at least 21 years old and could not have children younger than 14. 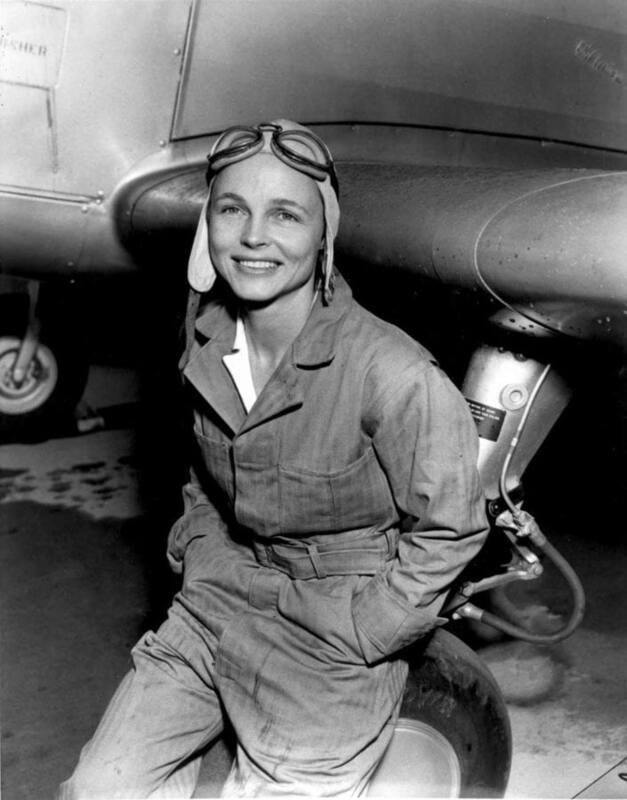 The WASP also accepted women as young as 18 if they had a pilot’s license and flight experience. Though Arnold requested that WASP pilots be commissioned directly into the AAF, his request was denied. 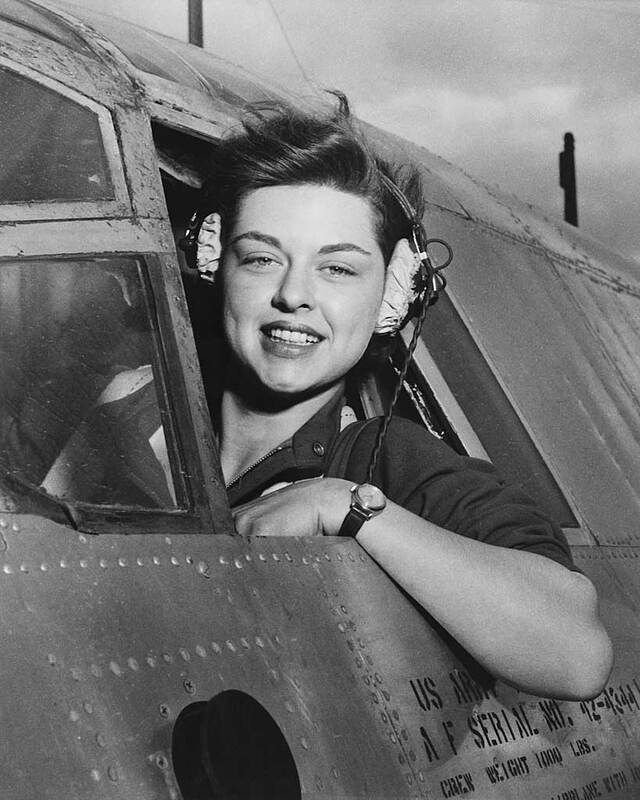 A subsequent attempt by Cochran and Arnold to get Congress to pass a bill making WASP a women’s service within the U.S. Army Air Forces failed as well. The women pilots of the WASP flew nearly every type of aircraft in U.S. service during their short existence, freeing males for other tasking. By 1944, America had trained tens of thousands of pilots and the urgent demand of 1942-1943 had been more than satisfied. Surplus manpower spelled an end for the WASPs, who were disbanded Dec. 20, 1944, after Congress voted down the WASP bill. While the WASPs never gained military status, they highlighted the capabilities of and possibilities for women. 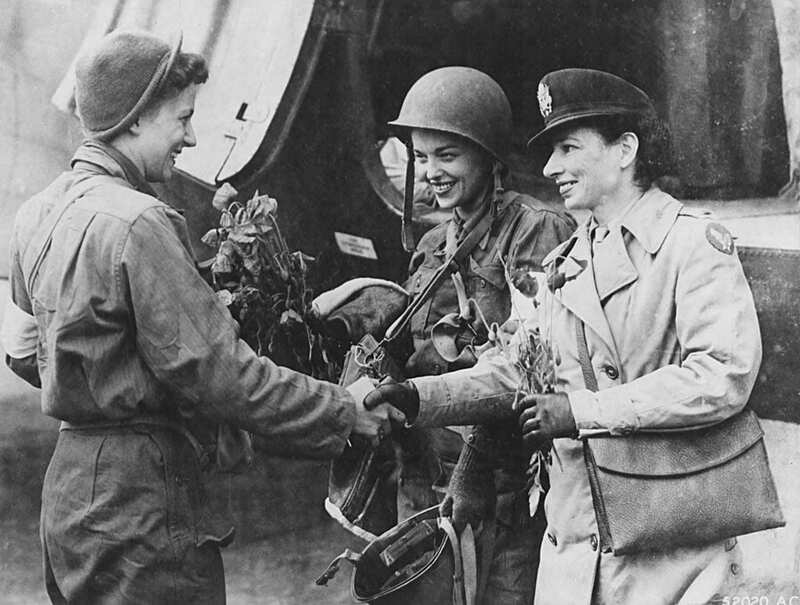 Many more women served the AAF as civilians in other roles. The immediate postwar period created uncertainty for the U.S. military that is simply forgotten today. A dramatic reduction in manpower, resources, and attention left the Army, Navy, and AAF in low-morale limbo for five years as the “peace dividend” was paid fully into American society. The uniforms first donned by the WAFs were adaptations of men’s uniforms with standard neckties. But May soon ordered new, distinct uniforms modeled on those of commercial flight attendants. Though using the same material as the men’s winter uniforms, tabs on the collar replaced the necktie. A new summer uniform – a two-piece, cotton-cord seersucker dress – fitted poorly and was generally disliked. While presiding over the decline in the strength of the military, many in the U.S. government remembered the perils faced by America’s withered armed forces just a decade prior. Such concern – along with Russia’s intent to alter the geopolitical landscape – led to the major restructuring of the government’s military and intelligence agencies known as the National Security Act of 1947. The act created the U.S. Air Force (USAF) as a fully independent service, coequal with the Army and Navy. Though there were plans to expand the new service from 55 to 70 air groups, President Harry S. Truman decided in December 1948 that the country could afford no more than 48 groups. What had been expansion became contraction. Even still, the newly minted Air Force struggled to recruit and retain qualified men as the peacetime economy boomed. A manpower problem of growing intensity surfaced. 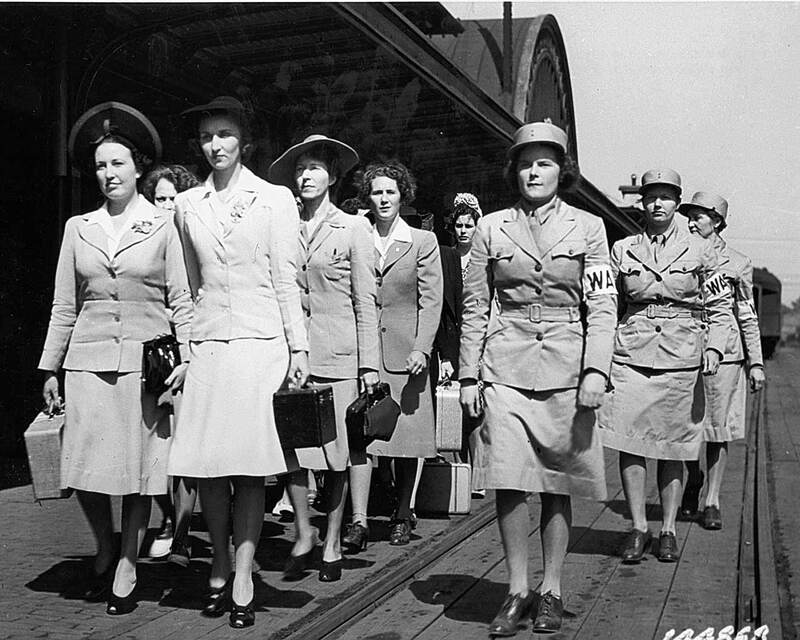 Newly arrived Women’s Army Auxiliary Corps recruits at Fort Des Moines, Iowa, 1942. As it did, Congress remembered the wartime resource that women had offered. On June 12, 1948, it passed the Women’s Armed Services Integration Act, establishing women as permanent, regular members of the Army, Navy, Marine Corps, and Air Force. The act set end-strength limits on the number of women inducted and its Section 502 excluded women from aircraft and vessels of the Air Force and Navy that might engage in combat. The limits didn’t deter Esther Blake, who joined the newly structured Women in the Air Force (WAF) on the first day it was possible to do so: July 8, 1948. Though she was the Air Force’s first female recruit, military service was not new for her. Blake was a widow who served with the WAC during the war, joining her sons who served with the AAF. 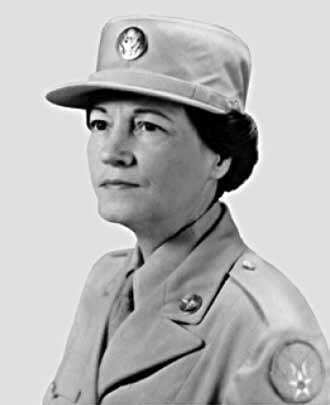 She transferred in from Fort McPherson, Georgia, and remained on active duty with the Air Force until 1954, rising to the rank of staff sergeant. Blake represented a select group of women in the new Air Force whose numbers were limited by law to 300 officers and 4,000 enlisted personnel. The first of those to receive basic training were sent to Lackland Air Force Base (AFB), Texas, in 1948. The Air Force desegregated basic training in 1949 and many African-American women subsequently joined as well. In January 1951, an all-female dance band was formed at Lackland AFB, subsequently known as the 543rd Air Force Band or the “WAF Band.” Some 235 women musicians played with the 543rd, which carried about 50 members at any time. The new female officers and enlisted alike filled a variety of clerical and medical ground duty roles. None were trained as pilots. They were commanded by Col. Geraldine Pratt May, the first director of the WAFs. May, too, had served in the war as WAC staff director of ATC. Her appointment as director of the WAF and commission as a colonel made her the first women to achieve that rank in the Air Force. Women would wear both uniforms as America ramped up for the Korean War. Additional manpower in the form of new recruits and recalled reservists expanded the Air Force from 411,277 personnel to 788,381 officers and enlisted. The expansion came with greater administrative demands, and WAFs replaced many men in staff positions in the United States, Europe, and Asia. By 1951, May had left active duty to serve in other government posts. The effort to further integrate women was carried on and while there were recruitment and organizational missteps, the involvement of women during and after Korea solidified their presence in the USAF. One of their most visible roles, surprisingly, was a musical one. Led by director Capt. MaryBelle Johns Nissly, the WAF Band represented the Air Force as ambassadors along with the all-male Air Force Band, marching in both of President Dwight D. Eisenhower’s inaugural parades, playing for President John F. Kennedy’s inauguration, and numerous concert engagements nationwide. Women serving in the armed forces took another step forward in 1967. Congressional passage of Public Law 90-130 brought with it legal requirements that women have equal promotion and retirement rights. It also removed the 2 percent cap on the number of women who could serve in the armed forces. Despite the band’s popularity, Nissly struggled with the limited resources as well as frequent personnel losses, as women who married were not allowed to continue as members. Lukewarm support from Air Force hierarchy combined with an overall manpower reduction in the late 1950s led to the WAF Band’s demise in 1961. 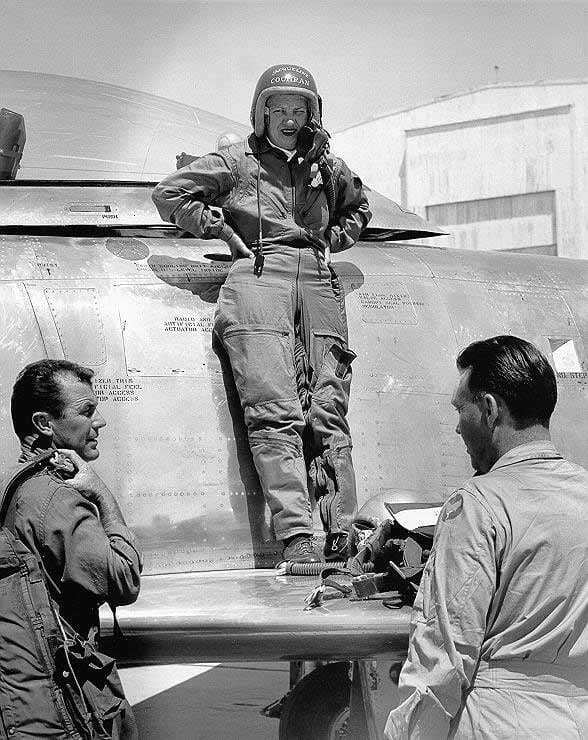 By the mid-1950s, the presence of women in the Air Force waned, failing to realize an expected end strength of 12,000. The actual WAF force numbered around 6,000. Fewer women were enlisting than expected and those on active duty often left, citing limited career opportunities as partial justification. In 1957, when a new cap on the WAF program set its number at 8,000, there were approximately 7,200 women on active duty, representing less than 1 percent of the total enlisted force of 734,000 in the Air Force. Ironically, as female representation diminished, a WAF section was introduced into the college-level Reserve Officers’ Training Corps (ROTC) program in 1956. By 1959, four universities were running ROTC WAF sections. By 1970, they could be found across the country. America’s involvement in the Vietnam War was unpopular with large segments of men and women, dampening recruiting prospects, especially for the latter, whose role limitations did not add to the allure of a stint in the Air Force. But not all women felt similarly. In 1965, Mary H. Rebkovich and Becky Sisson became the first female members of the Virginia Air National Guard (VA ANG). The pair were nurses at Richmond Memorial Hospital and Sisson had been dating a pilot in the VA ANG’s 149th Tactical Fighter Squadron. Informed that nurses would be welcomed in the unit, they interviewed and were commissioned 2nd lieutenants in August of that year. “We enjoyed the status of being the only females for a long time, too,” remembered Rebkovitch, who became a lieutenant colonel with the ANG. Sisson went on to serve with the Tennessee, Georgia, and Texas Air Guard units as well. The final chapter of the Vietnam War brought with it the end of the draft and the rise of the all-volunteer force. Concurrent social changes in American society suggested that women should no longer serve within an Air Force subdivision (the WAF), but rather as members of the total force. The lack of popularity of the 1970s military likewise meant that all hands would be needed to staff a volunteer force. In 1976, the separate status of WAF was abolished. Women would enter the service academies and the first class of women would enter pilot training as full-fledged military personnel. 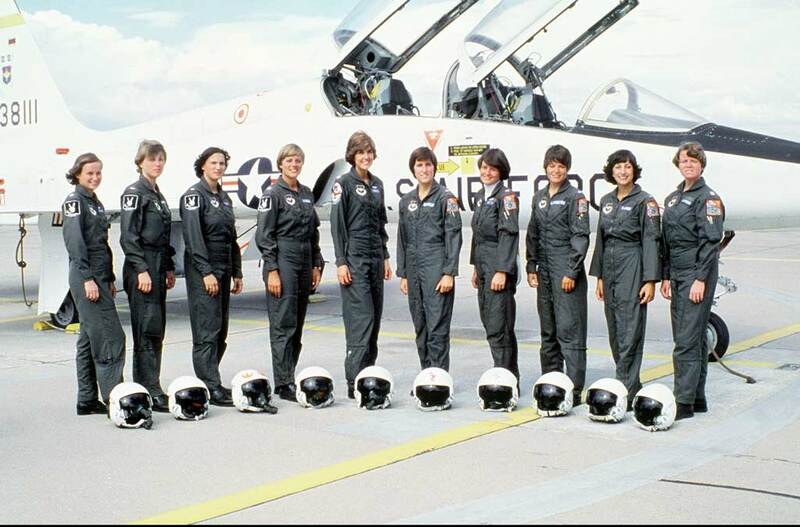 On Aug. 26, 1976, 10 women – five captains and five lieutenants – went to Hondo Municipal Airport in San Antonio, Texas, to begin the T-41 flight screening program. They were the first females in Air Force undergraduate pilot training (UPT), part of UPT Class 77-08. They proceeded to Williams AFB, embarking on a 48-week pilot training course with their male classmates. Each candidate accumulated 210 hours in the Cessna T-37 and the Northrop T-38, and 790 hours in academic, flying, and officer training. Capt. Connie Engel was the first woman to solo in the T-41 and T-37, and she was the first woman to lead a two-ship formation. Capt. Christine Schott became the first woman to solo in the T-38. All 10 women earned their wings. In 2003 during the second Iraq War, then-Capt. Campbell was flying close air support near Baghdad. Coming off her last pass, Campbell’s 75th Fighter Squadron A-10 was hit by ground fire. They would be trailblazers in the Air Force, going on to fly in support of combat missions including Grenada, Panama, Desert Storm, Desert Shield, and several African conflicts. The “firsts” they accomplished range from Capt. Kathy La Sauce becoming the first female pilot to command a C-141 and Schott commanding the first all-female aircrew in a C-9 to Capt. Sandra Scott’s debut as the first female tanker (KC-135) commander to perform alert duty for Strategic Air Command. 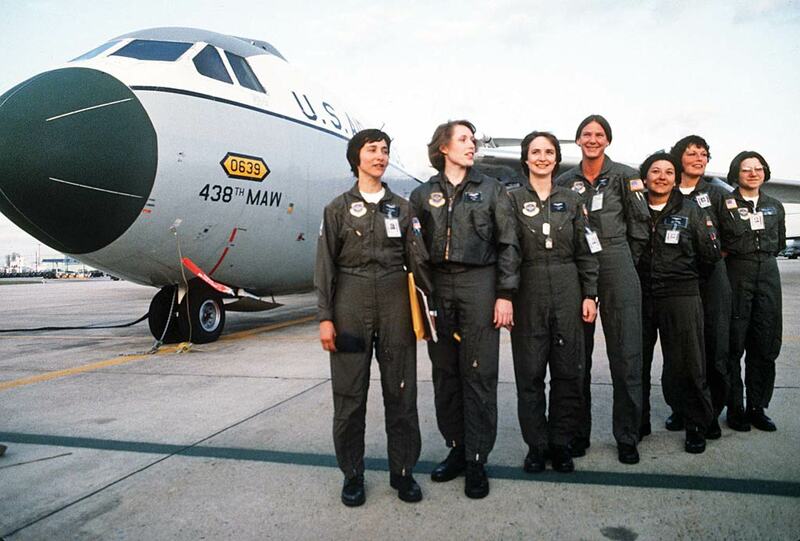 As the 1980s rolled into the 1990s, women entered a wide variety of mission specialties in the Air Force, from military police to missileers. More than 90 percent of career fields were open to women, including that of fighter pilot, after restrictions were lifted in 1991. Brig. Gen. Jeannie Leavitt holds the distinction of becoming the first female USAF fighter pilot, graduating from the F-15E Strike Eagle training course with the 555th Fighter Squadron at Luke AFB in 1994. Leavitt would go on to command the 333rd Fighter Squadron at Seymour Johnson AFB, then to command the 4th Fighter Wing. In 2016, Leavitt became the first woman to take control of the 57th Wing at Nellis AFB. She accumulated more than 300 combat hours flying the Strike Eagle over Afghanistan and Iraq. The first female to fly combat missions in an Air Force fighter would be Capt. Martha McSally. Today, McSally is a member of the U.S. House of Representatives from Arizona’s 2nd District. 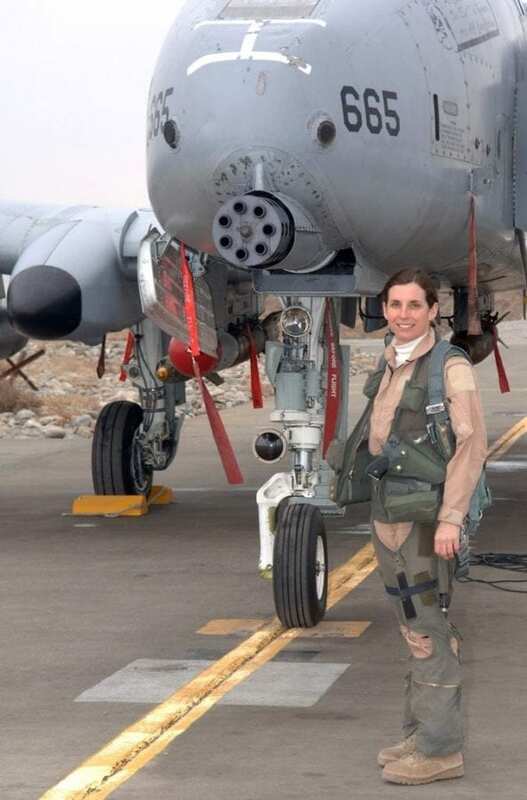 In 1995, she deployed to Kuwait and flew combat patrols enforcing the no-fly zone over southern Iraq at the controls of an A-10 Warthog. Many more would follow in McSally’s footsteps, including Col. Kim Campbell. Her Warthog had taken extensive damage to the starboard vertical stabilizer, horizontal stabilizer, aft fuselage, and engine. After trying several ways to regain control, Campbell engaged the backup mechanical flight control system. The jet responded, and with some help from her wingman, she landed back at her forward base. The combat experience gained by Campbell and other women further opened opportunities for women to serve in all areas, culminating with the Defense Department’s 2016 decision to open all combat positions to all qualified candidates regardless of gender. Though none has yet qualified, women began to apply for training for Air Force special operations positions including Tactical Air Control Party (TACP). 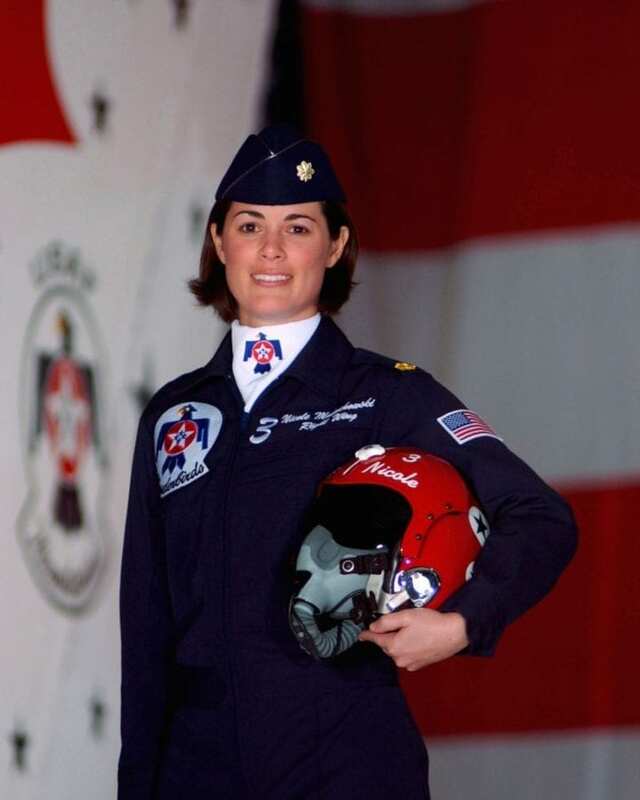 With women like Maj. Nicole Malachowski, who debuted as the first Air Force Thunderbirds demonstration team pilot in 2005, females have taken their place in nearly all Air Force job descriptions. As of 2017, women made up approximately 19 percent of Air Force personnel. 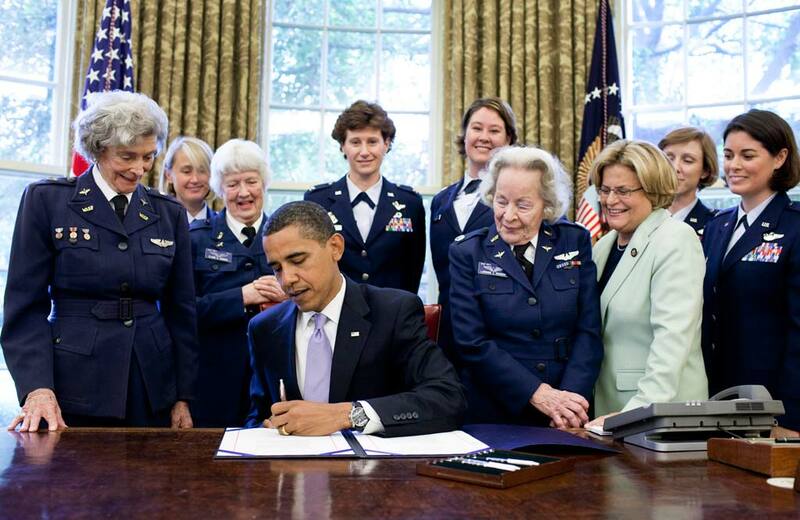 With more than 63,000 women in uniform, the Air Force counted more females in its ranks than any other service. None has aimed higher than four-star Gen. Lori Robinson. On May 13, 2016, Robinson was appointed as leader of U.S. Northern Command – the first female service member to lead a unified combatant command and thus the highest-ranking woman in U.S. military history. 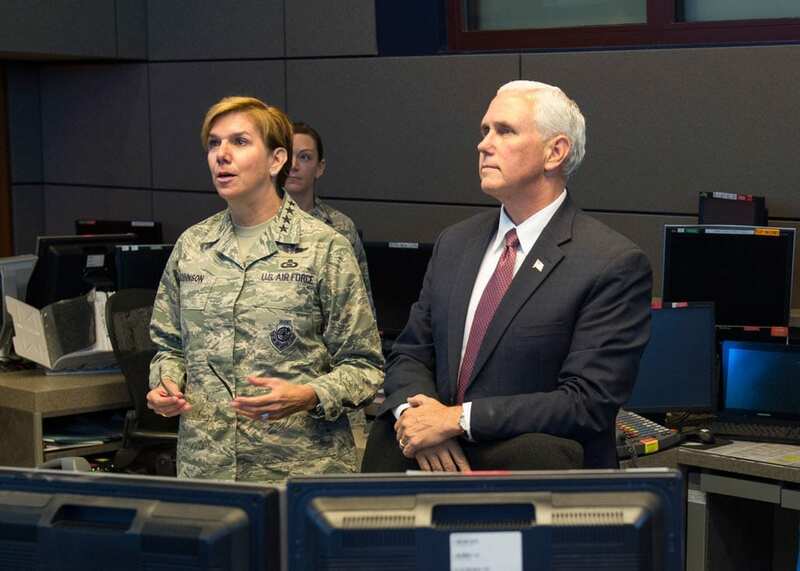 Robinson’s role as a major combatant command leader gives her a good chance of rising to the top role in America’s military: the chairman of the Joint Chiefs of Staff (JCS). President Barack Obama signs S.614 in the Oval Office July 1, 2010, at the White House. Her ascension to the JCS would no doubt please her WASP predecessors. Though heralded during World War II, women who served in the armed forces were not considered military veterans. That changed in 1977, when President Jimmy Carter awarded the WASPs full status as veterans, complete with benefits. In 2010, about 200 WASPs came full circle when they visited Washington, D.C., to accept the Congressional Gold Medal. This article first appeared in the Women in the Armed Forces: A Century of Service publication.